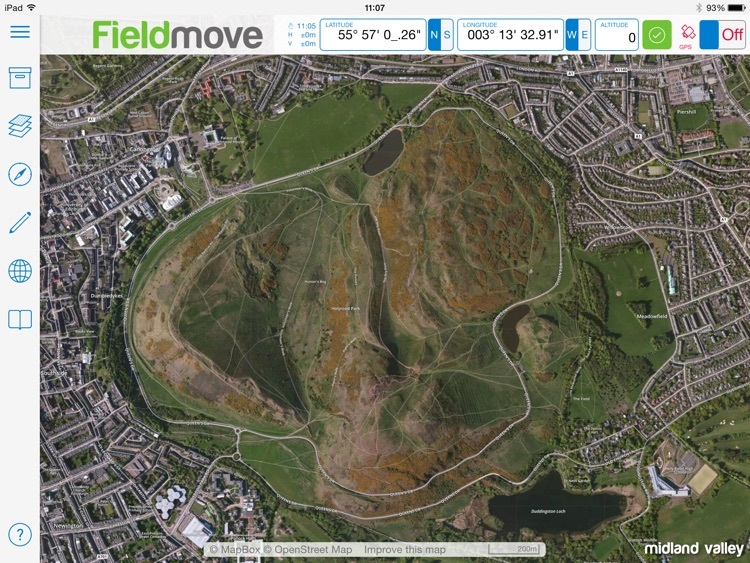 FieldMove is a map-based digital field mapping app for geological data capture. 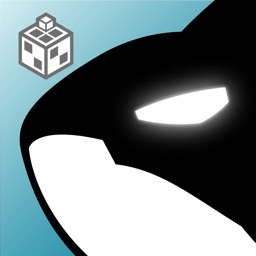 The app is presented in a map-centric format for use on larger touchscreen tablets. 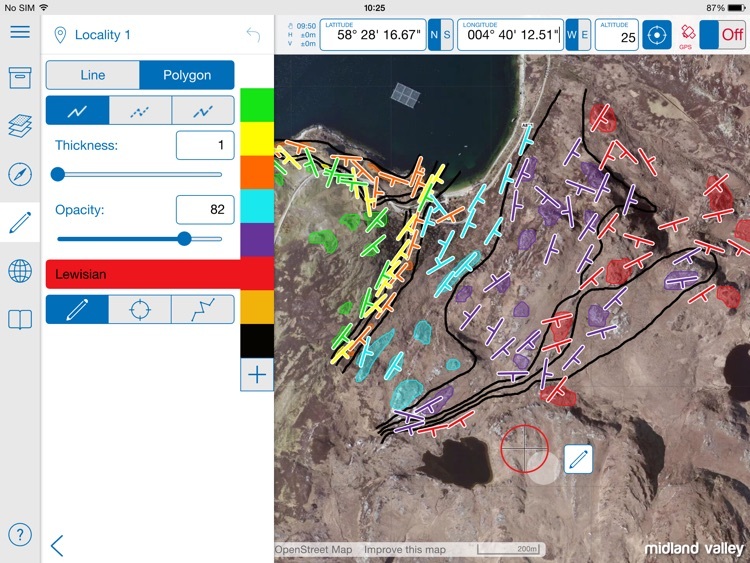 When sufficient data has been collected, you can use the drawing tools that include a virtual cursor for precision drawing to create geological boundaries, fault traces and other linework on your basemap. 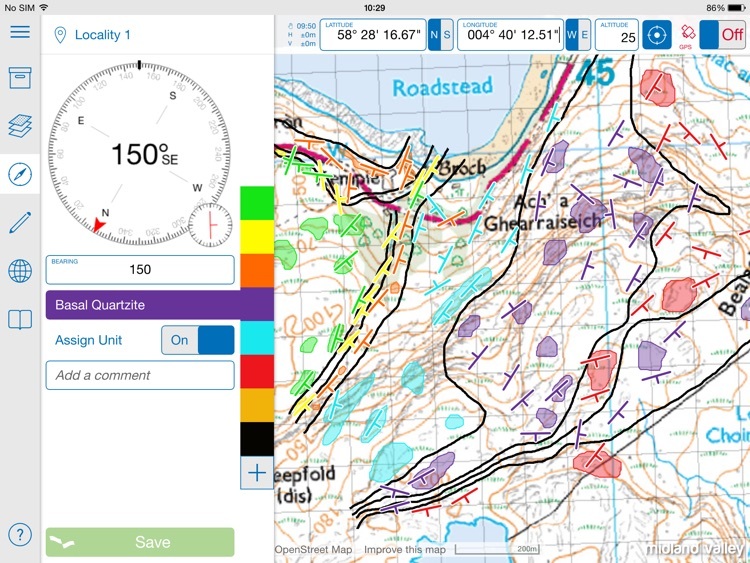 It is also possible to create simple polygons to show the distribution of different rock types. 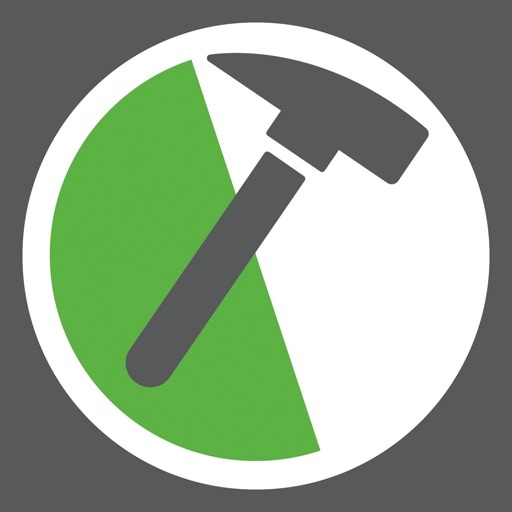 FieldMove supports Mapbox™ online maps and can cache this extensive online map service to work offline in the field. In addition to handling online maps, geo-referenced basemaps in MBTile or GeoTIFF format can be imported and also are available offline when working in the field. 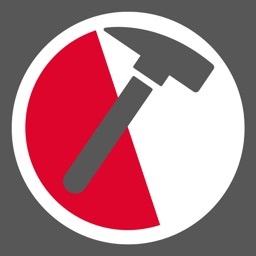 The app allows you to use your tablet as a traditional hand-held bearing compass, as well as a digital compass clinometer for measuring and recording the orientation of planar and linear features in the field. 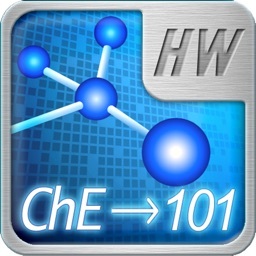 Geo-referenced text notes, photographs and screenshots can also be captured and stored within the app. 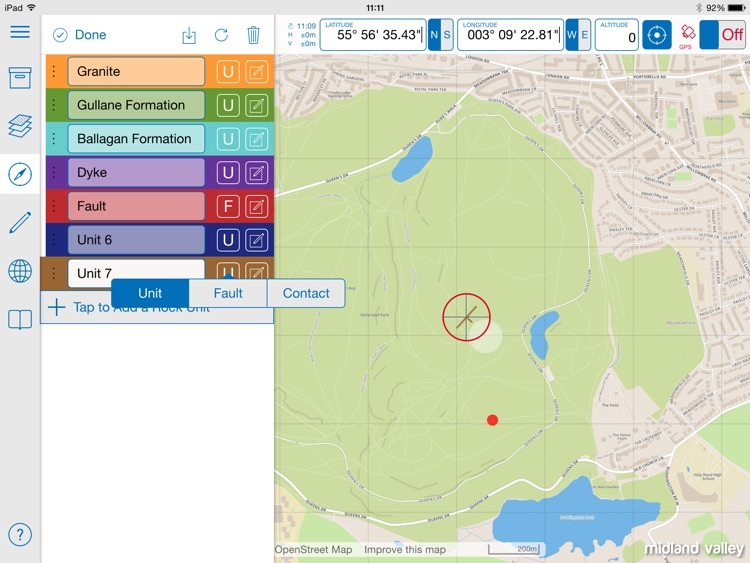 Also contained in FieldMove is a library of geological symbols that enables data to be plotted on a stereonet, which allows the user to carry out analysis based on their field observations and measurements. All data readings collected in the field and any linework digitized directly in FieldMove with the drawing tools are fully geo-referenced. 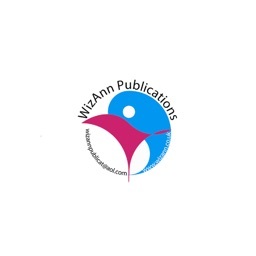 This information is preserved when the project is exported in various formats for use in other applications. Exporting your project is a quick and simple process. 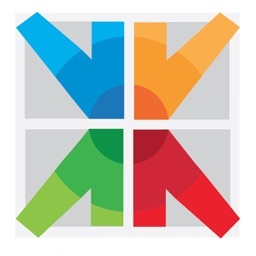 Data can be exported in three different formats: Move™ (.mve), for direct import into Midland Valley's Move software for model building and analysis, a CSV (.csv) file (comma-separated values, similar to an Excel spreadsheet), and as a Google Earth (.kmz) file. 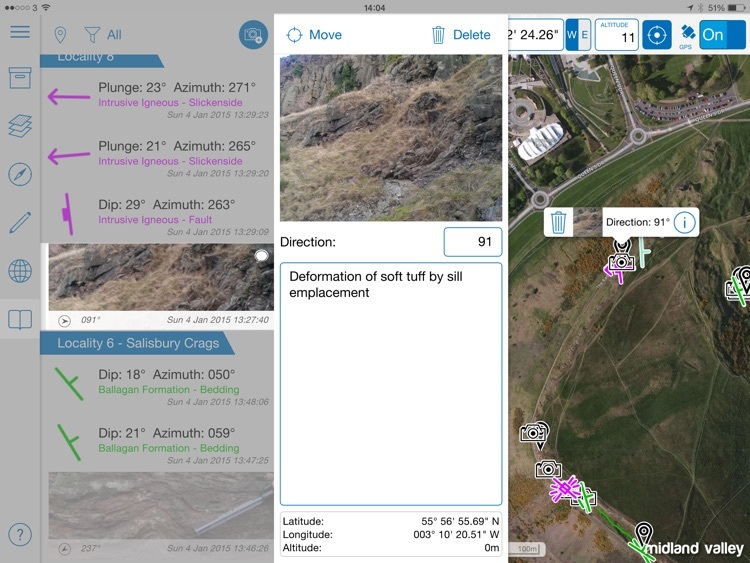 FieldMove is a Midland Valley geological field mapping app designed for forward thinking geologists utilising digital data collection. The use of GPS devices and tablets as navigation aids. Global Positioning System (GPS) devices are commonly used to aid navigation, having grown in popularity over the past decade. Over the last few years, this has extended to smartphones and digital compasses, which are often equipped with GPS functionality. FieldMove relies on three sensors inside your device, a magnetometer, a gyroscope and an accelerometer. Together, these sensors can be programmed to measure the orientation of planar and linear features in the field. All three sensors are installed as standard in iPhones and iPads, but are not always present in other hardware devices. You should always check your device to make sure that all three sensors are present and that the compass and the clinometer are giving accurate readings before starting to collect data. You can choose to manually enter data if you do not trust the internal sensors, or if you are using a traditional hand-held compass clinometer. Midland Valley will accept no liability or loss, resulting from the use or misuse of this product.